stephmodo: Point Reyes Plein Air "Paint Out"
Point Reyes Plein Air "Paint Out"
Point Reyes Station, in Marin County (north of San Francisco), is one of my favorite little towns. It's home to Cowgirl Creamery, a few Zagat-rated restaurants, an organic bedding and clothing company with the nicest staff ever, and a lovely little gallery called William Lester. 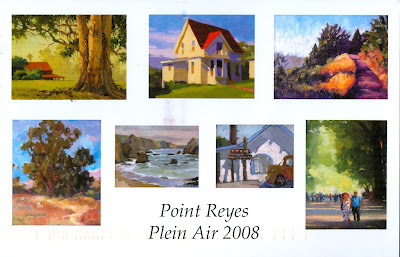 If you live in the area, head up to view the paintings from the 6th annual Point Reyes Plein Air Paint Out--an event where painters take 3 days to paint, paint, paint. I love so many of the artists they feature at this gallery and dream of owning one someday. Until then, it's so nice to look and be inspired! Oh my what amazing paintings! I especially love the purple shadows on that simple cottage.